Dr. Ryan Noah uses braces as an orthodontic treatment to correct crooked and misaligned teeth—and not just for children and teenagers. In the United States many adults are opting for braces later in life to fix crooked teeth that may have bothered them for years. A perfectly aligned, gleaming smile can be achieved and boost self-esteem levels. Crooked teeth can make it hard to chew and speak correctly. Out of alignment teeth can cause jaw clicking and headaches. Crooked teeth are hard to clean and makes you susceptible to gum disease. Traditional braces are available to straighten your teeth, giving you a beautiful smile that will make you feel confident. Once your treatment is done, you’ll also get teeth that can be brushed and flossed easily and are more resistant to gum disease. Teenagers enjoy expressing themselves with multi-colored bands as shown in the image to the right. 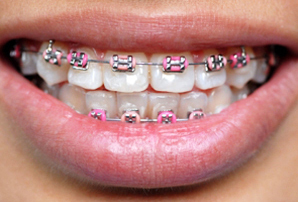 Traditional orthodontics typically take a period of 18-24 months. Our orthodontic services are generally handled at our Glenpool location (918) 321-2000. There is another option besides the traditional wire and brackets, and that is Invisalign. They are faster, more comfortable, and no one will know you’re wearing them. Click here to read more about Invisalign invisible braces. If you’re considering orthodontics, you may call to schedule a complimentary consultation with Dr. Noah. He’ll answer your questions and help you decide which treatment, traditional braces or Invisalign, is a better option for you. If you prefer, you may click here to request an appointment online.